One thing that is a basic requirement for living in the British Isles is a decent winter coat. Unfortunately you can be wearing it from about October to March (and maybe September and April too!). I made this green winter coat in January, but my black shop bought winter coat has definitely seen better days. So, obviously, I'm going to make a new one! Winter coats don't make themselves in a weekend (more's the pity! ), which is why I'm starting it now; also, I really don't want to be hand sewing black fabric with black thread when it's dark in the evening. As I've already done a lot of work on it before even cutting into the fabric, I'm planning to do a few blog posts on this. 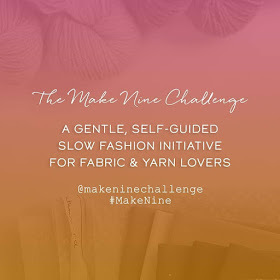 I love reading posts about the thinking and construction behind garments, so I'm hoping some people will find this interesting. I had pinned this gorgeous coat on Pinterest ages ago, I believe it was originally from Top Shop, and it's basically what I'm aiming for. I love the big collar and lapels, the pocket flaps and epaulets. 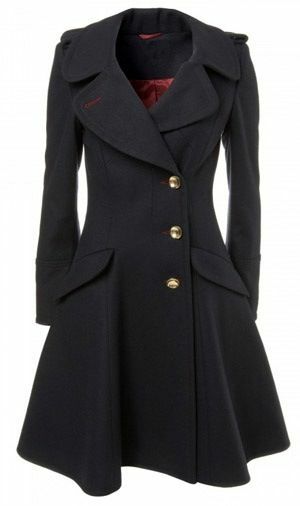 But there are a couple of other coats that I'm pinching ideas from too. 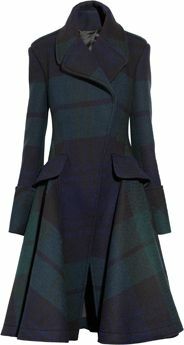 This Alexander McQueen number below is absolutely gorgeous. 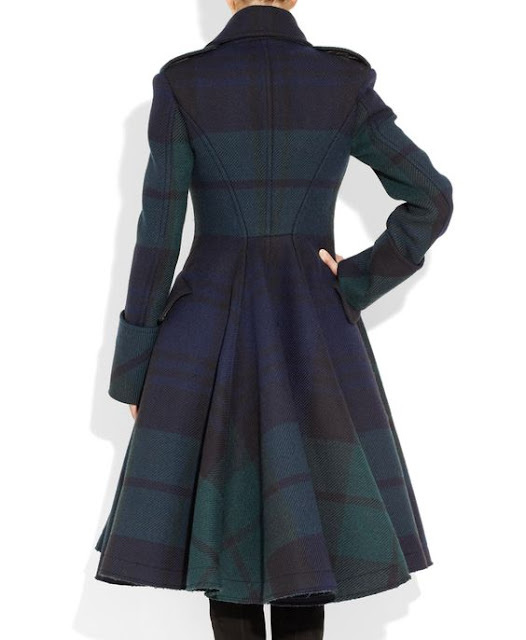 It's pretty similar in design to the Top Shop coat, and I love the big cuffs on the sleeves. Also, lets take a moment to appreciate the amazing print matching on the tartan! 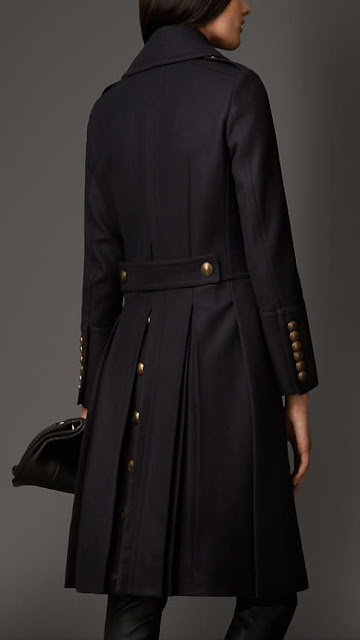 I also love the tab on the back waist of this Burberry coat, so am hoping to incorporate this too. After a lot of searching, I finally settled on Vogue 8346, View B. I found lots of patterns for notched lapel coats which were single-breasted, but this was the only double-breasted coat I could find. I'm a bit disappointed with the lapels and sleeves, but will talk about that more in my next post which will about all the alterations I made, and the embellishments I've added. But I'm very pleased with how my toile has turned out, and my fabric is gorgeous. It's a slightly textured fabric from Sherwood Fabrics, and is 80% wool and 20% polyester. It's doesn't have a name, just a reference number which is SA743. And, even better, it was originally £28 per metre, but is on sale at £15.90 per metre. Hurray! I'm going to use some red polyester Duchess Satin for the lining, and I got it in The Spinning Wheel in Belfast. I don't think I got enough thought, so might have to go back for more - not a hardship! My buttons are from Totally Buttons, and are so lovely that I decided to make bound buttonholes. If you follow me on Instagram you will see that they are already done. Me being me, I can't do things the easy way, and am going to hand-tailor the lapels and collar. 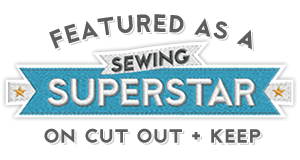 I really enjoyed doing this on my Butterick 4610 jacket, so want to try it again with this. Next time I will show you my toile, and the pattern alterations that I've made. Thanks Colette! I'm really enjoying making this. 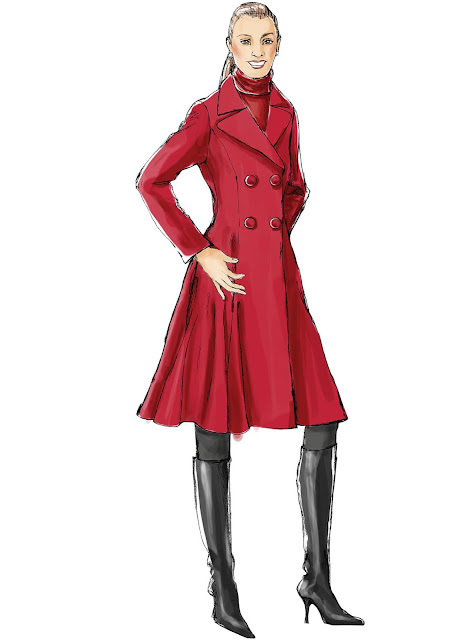 It's a pattern with good bones, but I wish there were more double-breasted ladies coat patterns. Great inspiration pics Lynne - and I love the buttons! Looking forward to seeing your coat take shape! Thanks Ruth! Today I'm hoping to get all the pad stitching finished on the collar and lapels, and the twill tape sewn on. Thanks Allys! Yes, the Alexander McQueen hem had me scratching my head. I'm not really sure what's going on there! Good luck with your coat, Chloe is a gorgeous pattern. Really interesting to see the coats that have inspired your choice of pattern. Thanks Helen! 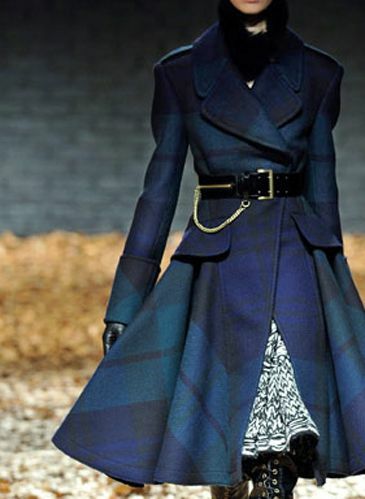 I do love a fancy coat, and there are some gorgeous one's for inspiration.